Climate change and infrastructural neglect are taking a serious toll on the water quality of the drinking water being pumped into residences around the country. While activists fight for more resources and funds to go toward infrastructure repair in wake of the lead crisis and other contaminations in regional water supplies, regulatory agencies maintain a level of control by testing the water that enters our homes to ensure it's safe to drink. Many families assume that their own tap water is impervious to contamination until they see murky or milky water spewing out of their faucet or shower. Seeing unclean water can be shocking, but at least you'll confidently know your water is unfit to consume. In many instances, like when lead leeches into the water in your pipes, it's undetectable to the human eye. To alert families when their water is contaminated local regulatory agencies will issue boil water notices to limit the damage. Boil water notices are on the rise in the United States. 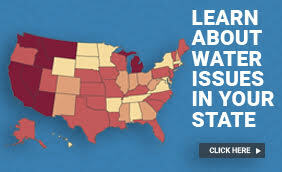 To protect your family from the illnesses and chronic health problems that can result from consuming tainted water it's imperative to educate yourself about the ins and outs of boil water notices. This helpful infographic breaks down the steps to take when a boil water notice is issued in your area. How can your water get contaminated? How common are boil water notices where you live? Read on to find out everything you need to know to be prepared when you receive a boil water notice.